It was a dramatic week for University of Chichester sport teams. There was heartbreak for the netball third team who missed out on winning their league in the last game of the season, losing 44-42 away to Reading in a title decider between the top two. The ones, twos and fours lost as well but the fives beat Royal Holloway to set up a decider against UCL (RUMS). Chi’s mixed golf beat Reading up at Goodwood to seal the league. 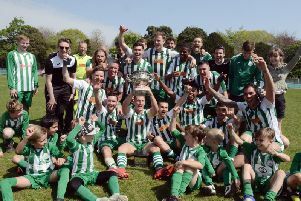 That left the golfers with a chance of a league and cup double and were due to face Reading at the same course in the South Eastern Conference Cup final. The Chi men’s table tennis team closed out their perfect league season with a win over Surrey. They will now compete for a Premier South spot in the play-offs. In racquets, Chi’s men’s badminton ones picked up a win at Kingston to guarantee a second-place finish behind Imperial. An impressive 10-2 home win against Surrey meant the men’s tennis team needed something out of their last match against Sussex to clinch their league. It was a case of mixed fortunes in hockey. The women’s first team crushed Kingston 7-1 but the men’s ones could only manage a draw with basement team Kingston. They need to beat Sussex in the last game of the season to ensure South Eastern 2A survival. The men’s second team lost to Imperial 3-1. In rugby there were home victories for the men’s second XV and the women’s side, whose 12-10 second-half comeback win over Surrey gave them a top-three finish in a fiercely-competitive South Eastern 1A division. Chi’s men’s volleyball ones finished their season on a high with a win at league leaders Hertfordshire and the women’s second football team beat Surrey ones 2-0.